The amount of opioids prescribed in the U.S. quadrupled from 1999-2014. Unfortunately, opioid-related overdose deaths have increased in parallel with prescribing increases, and the amount of pain that patients report remains unchanged. The CDC Guideline for Prescribing Opioids for Chronic Pain provides recommendations for safer and more effective prescribing of opioids for chronic pain in patients 18 and older in outpatient settings outside of active cancer treatment, palliative care, and end-of-life care. During this COCA Call, clinicians will hear an overview of the CDC recommendations and learn when and how opioids should be initiated for chronic pain, how to assess risk and address harms of opioid use, and when and how opioids should be discontinued. This is the first call in a series of 4. During this COCA Call, clinicians learned about the treatment, management, and prevention of tickborne diseases in the U.S., with an emphasis on Lyme disease, Rocky Mountain spotted fever and newly emerging tickborne diseases. A low proportion of persons who had testing for Zika virus in the United States had confirmed Zika virus infection. Approximately 99% of asymptomatic pregnant women who were tested had no laboratory evidence of Zika virus infection. Given the potential for adverse pregnancy and infant outcomes associated with Zika virus, healthcare providers can continue to offer Zika virus testing to asymptomatic pregnant women with potential exposure. However, these data suggest that in the current U.S. setting, the likelihood of Zika virus infection among asymptomatic persons is low. Clinical Consultation Service for Health-Care Providers Caring for Pregnant Women with Possible Zika Virus Infection. CDC maintains a 24/7 consultation service for health-care providers caring for pregnant women with possible Zika virus infection. This consultation service is NOT for patients or the general public. 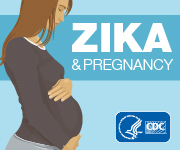 To contact the service, email ZikaPregnancy@cdc.gov or call 770-488-7100. CDC does not recommend routine use of insecticides (disinsection) inside commercial passenger airplanes to prevent the spread of Zika virus. During November 1, 2015–April 14, 2016, a total of 6,157 specimens from suspected Zika virus–infected patients from Puerto Rico were evaluated and 683 (11%) had laboratory evidence of current or recent Zika virus infection. E. coli bacteria carrying the mrc-1 gene was found in a urine sample from a Pennsylvania woman with no recent travel outside of the U.S. The mcr-1 gene makes bacteria resistant to the antibiotic colistin, which is used as a last-resort drug to treat patients with multi-drug-resistant infections, including carbapenem-resistant Enterobacteriaceae (CRE). The mcr-1 gene exists on a plasmid, a small piece of DNA that is capable of moving from one bacterium to another, spreading antibiotic resistance among bacterial species. The CDC and federal partners have been hunting for this gene in the U.S. ever since its emergence in China in 2015. CDC is collaborating with public health and regulatory officials in multiple states and the U.S. Food and Drug Administration (FDA) to investigate a multistate outbreak of Shiga toxin-producing E. coli O121 (STEC O121) infections. Thirty-eight people infected with the outbreak strain of STEC O121 have been reported from 20 states. Since January, CDC has been assisting with the investigation of two outbreaks of infections caused by Elizabethkingia anophelis in the Midwest. Although Elizabethkingia is a common organism in the environment, it rarely causes infections. CDC is assisting with testing samples from patients and a variety of potential sources, including healthcare products, water sources and the environment; to date, none of these have been found to be a source of the bacteria. The FDA has received reports of U.S. patients infected with M. chimaera after undergoing cardiothoracic surgery that involved the use of the 3T. Medtronic Respiratory & Monitoring Solutions is recalling the battery packs due to a manufacturing defect that causes an increase in temperature within battery that may cause a fire in the system monitor.